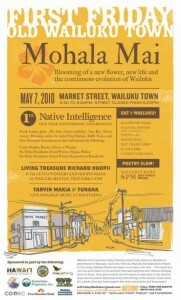 Native Intelligence in Historic Wailuku Town celebrates the start of the Makahiki season with the 1st Annual Makahiki no Wailuku event. Â Â The festival in honor of the god Lono, covers four lunar months and is marked by a kapu on war and celebrated with games, sports and feasting. 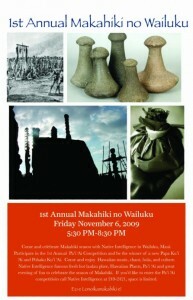 This time of enjoyment and celebration of tradition will be kicked off with cultural demonstrations, Hawaiian food, Hukihuki (tug-of-war), Ulumaika, moa pahe’e, konane, and the 1st Annual Pa’i’ai competition.Â There will also be fresh, homemade laulau for sale at Native Intelligence. 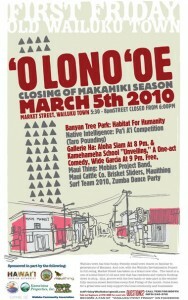 The celebration is part of the First Friday events in Wailuku Town that runs from 5:30 to 8:30 p.m. on Market Street in Wailuku.Â Opening ceremonies are set for 6 p.m.